This 4mm high stretch neoprene padded wetsuit is ideal for kite surfers, wind surfers, and sailors that want to be warm and comfortable doing what they love. An added bonus is that bumps and bruises are the thing of the past with strategically located protective panels on the thighs, knees, shins, elbows, and forearms. Don’t show up to work anymore all banged up and bruised after a weekend of fun on the water. It also features a front opening top panel zip with a one-piece sealed neck to prevent water flush-through. – Soft 4 way stretch 4mm Neoprene for flexibility and warmth. – Zippered neck entry – unhindered range of motion range of, sealed to prevent flushing, and easy neck entry. 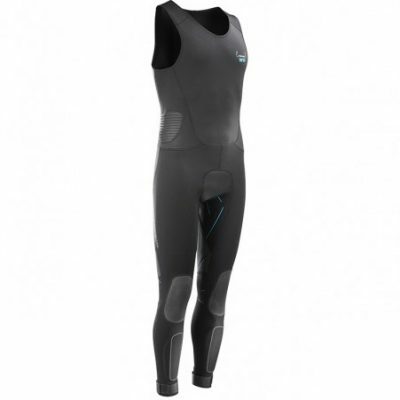 – Smooth Skin Neoprene chest and back panels, warm in and out of the water and prevents evaporative cooling in the wind. – Strategically located flexible knee, shin, hip, elbow and fore arm padding to take the blows so you dot have to. – Removable Velcro ankle cuffs to prevent water from coming in thru the ankles. – Glued, blindstitched and taped seams, for ultimate warmth and longevity. Small fits 5’4″-5’6″ tall, waist 27″-29″, chest 34″-36″, hips 32″-34″. Large fits 6′-6’2″ tall, waist 35″-37″, chest 42″-44″, hips 40″-42″. X-Large fits 6’2″-6’4″ tall, waist 37″-39″, chest 44″-46″, hips 42″-44″.